Mulling is an old practice, one that involves infusing warmed juices, ciders, or wines with a collection of luscious ingredients, and results in a smooth and soothing evening beverage. Our Mulling Spices follow the traditional ingredients of cinnamon, cloves, allspice, and dried orange peels, which create a well-rounded brew that is sweet, light, and addicting! 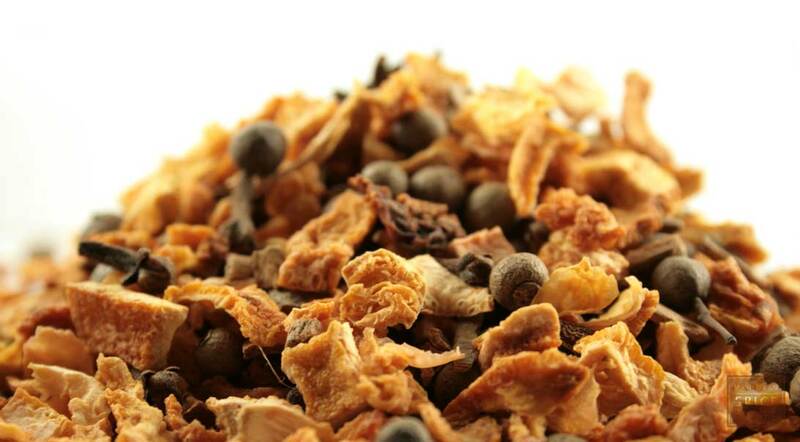 Prepare a fragrant cup using our Mulling Spices and enjoy a cornucopia of exciting flavors! Mulling is an ancient practice that dates to 2nd century Rome, when wine was heated and infused with various spices. As the Romans traveled across Europe, mulled wine was introduced to the people, who embraced the beverage that eventually came to be known as wassail. It was especially popular in medieval England during the winter months, although mulling spices were used to flavor beer and cider as well as wine. While you make mulled wine with our combination of dried orange peel, allspice, cloves and cinnamon a holiday tradition at your home, don’t overlook the everyday joy of infusing our mulling spices in tea, fruit juices, and even gin and vodka! Orange peel, cinnamon, cloves, and allspice.